In my professional life I have attended many seminars and workshops. Some of those seminars or workshops have been funded by my employer, and others I have paid for myself. Looking back over some forty plus years of classes—let’s go ahead and call these seminars and workshops that—I think that the average price of any of these half day classes has to have averaged at least a hundred dollars per session; perhaps it has been even more. In some cases, it has been definitely more. What is a good seminar or class worth if you really need the information? Would you consider 205 minutes—that’s about three hours and twenty-five minutes—a good morning or afternoon—of vital information worth about $75 or $80 dollars if there was a guarantee that you could "retake" the class at a later date at no charge? You can do that here easily enough, and I consider it a dirt-cheap price for the product. What I am discussing is an excellent training DVD aimed specifically at Digital Photographers who are just getting their feet wet with Adobe Photoshop and are a bit intimidated by all the information that doesn’t seem, at the moment, to be pertaining to their specific interest in digital photography. After all, Photoshop can do a great deal more than just allow retouching. Photoshop has replaced the darkroom in the workflow process of the current photographers who have embraced digital photography. When I started Photoshop back somewhere around version 3 or 4, the process was a pretty much hit-or-miss learning affair and I would have given a lot to have someone take me through the specifics of what I wanted to know. That’s why I’m quite pleased with the DVD Adobe Photoshop CS3 for Digital Photographers featuring Scott Kelby and produced by Kelby Training. If you have had the pleasure to actually attend a Scott Kelby training lecture you will find him outgoing, personable, articulate and with a really excellent ability to communicate. This training DVD takes you through those techniques of retouching that most benefit the digital photographer. That other stuff you can leave until later. As an aside, someone may question why I have been reviewing so many Photoshop books lately. There are actually several reasons. It’s so hot in this part of Texas at this time that being outside at any time other than early morning or late evening seems to happen only for sufficient financial remuneration or absolute necessity. Otherwise, it’s stay indoors and work or read, and since I’m working up a list of supplementary teaching materials for fall, I’m doing quite a bit of reading and evaluating. I’m building up my list of books and DVD’s that I will either depend on myself or suggest as supplementary or reference material. 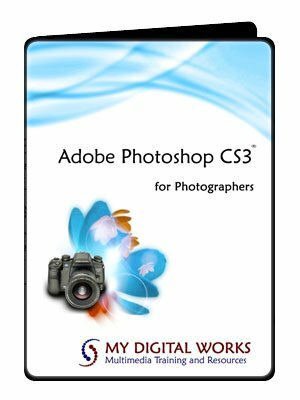 And that brings us back to Scott Kelby and Adobe Photoshop CS3 for Digital Photographers. Let’s take a look at the DVD content. Oh, if you don’t have Shockwave software installed already on your computer, you are going to need to add it in order to run the content, and the DVD won’t run on a TV set; it only runs on your computer. It’s for both Mac and PC. For me, the whole DVD was interesting. Though I have used Photoshop for many years I am always open to either reinforcement or reeducation. As I have reviewed a number of new books and DVD’s in the past few months I have tightened my workflow in a number of areas and completely revised it in a few other parts. As the kind of person who learns better from seeing than I do from reading, I can say that I thoroughly enjoyed the learning process via Scott Kelby’s DVD. He makes things clear, describes processes in plain language and does not talk down to the viewer. In short, for me, he maintains an excellent balance in his presentation manner. I recommend this DVD to the digital photographer in particular, and anyone interested in Photoshop retouching in general.